FXpansion has released a new creative delay plug-in known as Bloom. This comes with a diffusion reverb plus additional EQ, drive and saturation effects. There's also flexible routing and a TransMod modulation system that enables you to modulate parameters with the likes of step sequencers, LFOs and an envelope follower. Bloom is available in VST, AU and RTAS formats and costs £69. Find out more below. FXpansion is proud to present Bloom, a creative delay effect with additional diffusion network and effects with flexible routing. 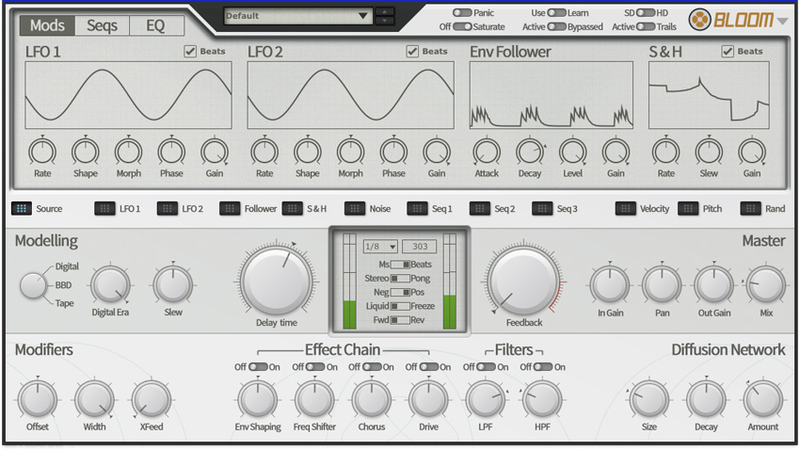 Its advanced TransMod modulation lets you automate parameters to create an amazing array of creative effects. At Bloom's core is a stereo delay line switchable between analogue BBD, tape and digital models, with a lush diffusion reverb algorithm providing stunning spaciousness and dimension. The diffusor is switchable between 3 possible positions in the signal path, as is the additional effect section containing filtering, chorus, frequency shifting, overdrive, saturation, EQ and envelope-shaping, which makes an extremely wide variety of creative effects possible. Other highlights include reverse and ping-pong modes, a freeze function and adjustable smoothing for delay time changes. Bloom's TransMod modulation system lets you modulate almost all its parameters with a variety of sources - built-in step-sequencers, LFOs, envelope follower and more. Additional MIDI-derived sources let you change the delay time per note or vary the feedback amount with note velocity. You can even modulate modulators with each other to create fascinating new shapes of movement. The plugin also includes an internal MIDI learn system for tweaking parameters live, turning Bloom into a versatile performance effect.